I made bread today because my children are coming and home means many things and bread is certainly one of them. 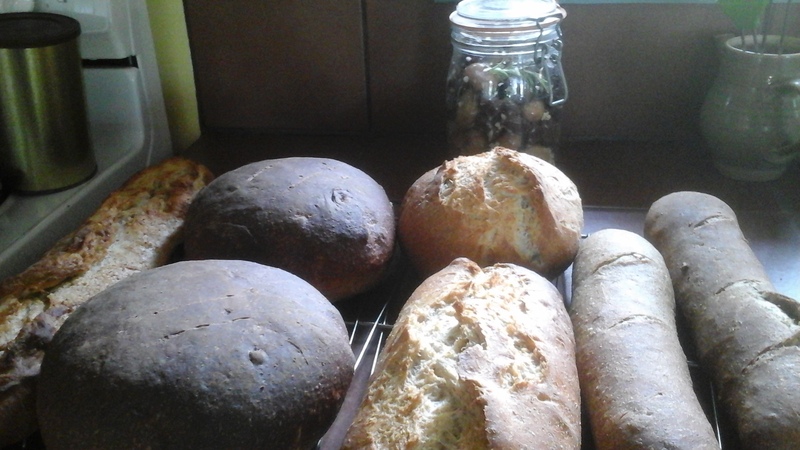 My mother made bread all the years of my childhood, 10 or 12 loaves a week, and all the years my children lived here, I made most of our family’s bread. As many times as I make the dough, knead it, shape it, bake it, I am always moved by that most sacred transformation of wheat and water (and a little sourdough starter) to loaves to nourish us and sustain us. Tonight we’ll make a meal of it, with cheese and smoked salmon, some chicken liver mousse, olives (which you can see behind the loaves), wine of course, and a platter of garden tomatoes, dressed with olive oil and basil. I wish it was true that every living thing could have its share. One of the tragedies our species hasn’t been able to take seriously enough to solve — the plenty, the abundance (in my own kitchen), and the scarcity in other places. You’d think a civilization that took such things as space travel and automated cars seriously could also work out how to feed the hungry among us. ~ by theresakishkan on July 28, 2015. This entry was posted on July 28, 2015 at 3:56 pm and is filed under Uncategorized.You can follow any responses to this entry through the RSS 2.0 feed.You can leave a response, or trackback from your own site.